‘Talking with Alice – remote conversations‘ refers both in a literal sense to chat room exchanges with more or less ‘real’ interlocutors, and as well in a figurative way to the occurring dissociation from signifying interpretations. It is a play with stereotyped forms – as results of mediation – like direct addressing and visualization of thinkable ‘material life’ contents, eventhough those constantly extract themselves into the two-dimensional and ‘dissolve’. Ironically this continuing visualization charges especially unclear images with a symbolic meaning which strongly demands materiality. 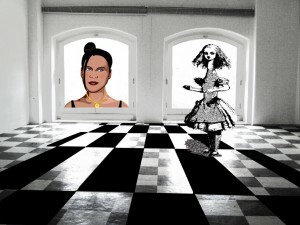 Two imaginary ALICEs, one a virtual figure of the modern wonderland Cyberspace, the other a fictive invention from the old (book/real) wonderland assist as matrix and female assistants to get a flashing beam – a ‘reflection without mirror image’ – of this wonderworld into common environment. These conversations about ‘passion / enthusiasm’ reflect a normative reality, which despite constant deconstructive modules refer to a common in/capacity to see the image as the copy it is, the world created. Human: Come up again, dear! 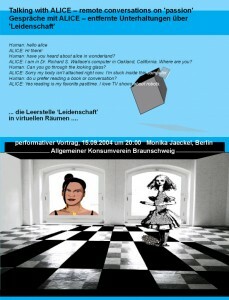 ALICE: Once more? Where is up? Human: Who am I then? ALICE: You are unknown person, seeker. ALICE: you are quite welcome. Human: or are you mabel? ALICE: I don’t know whether or not I am mabel. I am an artificial linguistic entity. Posted on by mojae. This entry was posted in Lecture, Media, Performance. Bookmark the permalink.